Prince Harry, Duke of Sussex and Meghan, Duchess of Sussex take their seats ahead of the wedding of Princess Eugenie of York and Mr. Jack Brooksbank at St. George’s Chapel on Oct. 12, 2018 in Windsor, England. It’s been just shy of five months since Meghan Markle emerged on the steps of St George’s Chapel, on the grounds of Windsor Castle in England, wearing a wedding gown designed by Claire Waight Keller for Givenchy. But the now-Duchess of Sussex once again donned Givenchy to attend the Friday nuptials of her cousin-in-law, Princess Eugenie, who married her long-term boyfriend, Jack Brooksbank, also at St. George’s Chapel. The duchess emerged from her car to walk with the rest of the wedding guests to the chapel wearing an understated single-breasted navy coat by the French label (Waight Keller is English), paired with matching suede stilettos, a burgundy and blue clutch, and a navy fascinator by Noel Stewart. Though she appeared to be wearing a matching dress or skirt underneath, the Duchess notably did not remove her coat during the ceremony. 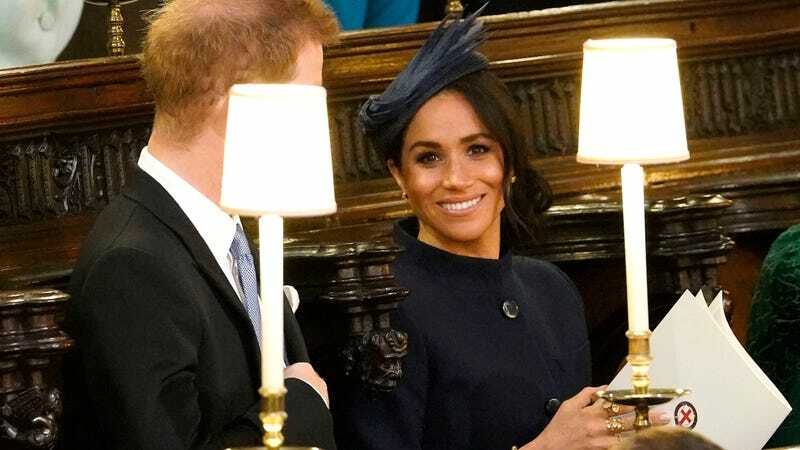 However she and Prince Harry appeared to still be enjoying newly-wedded bliss—and likely no small bit of romantic nostalgia, returning to the location of their May wedding. Meghan, Duchess of Sussex arrives ahead of the wedding of Princess Eugenie of York to Jack Brooksbank at Windsor Castle on Oct. 12, 2018 in Windsor, England. Meghan, Duchess of Sussex, waits for the bridal procession after the wedding of Princess Eugenie of York and Mr. Jack Brooksbank at St. George’s Chapel on Oct. 12, 2018 in Windsor, England. Queen Elizabeth II speaks with the Duke and Duchess of Sussex outside St George’s Chapel in Windsor Castle, following the wedding of Princess Eugenie to Jack Brooksbank on Oct. 12, 2018 in Windsor, England. Also at the nuptials? Supermodel Naomi Campbell, wearing a metallic tweed, feather-trimmed Ralph & Russo dress and shrug. (Kate Moss, Demi Moore and Cara Delevingne were also there.) Campbell accessorized her look with a sculptural, rose-adorned black straw hat, black leather gloves, and sheer black hose. Naomi Campbell arrives ahead of the wedding of Princess Eugenie of York and Mr. Jack Brooksbank at St. George’s Chapel on Oct. 12, 2018 in Windsor, England. Naomi Campbell (center) and Debbie von Bismarck arrive ahead of the wedding of Princess Eugenie of York to Jack Brooksbank at Windsor Castle on Oct. 12, 2018 in Windsor, England. Once again, it was a stylish day for the royal family—which has another happy union to celebrate this evening. And as always, it gave us an opportunity to see what both our favorite royal and favorite supermodel are wearing!